If you have a firearm or an entire collection of guns that you need appraised Contact Us and ask for Al. Why have your firearm or gun collection appraised? Most guns continue to increase in value. It is important to regularly update your insurance coverage and gun valuation in the event of loss or damage. A friend or loved one may be going through a divorce and may need to have their spouse’s firearm collection appraised. In the event of a loved one passing, family members may not be aware of the true market value of the gun collection. Unfortunately, there are always a few who will want to take advantage of your lack of knowledge. Don’t be cheated. Need Help Selling Your Gun Collection? If you decide to sell your gun or sell your entire gun collection, we can help you by listing your guns for sale on our website and also displaying them for sale in our store. We also handle all of the required paperwork on your behalf. 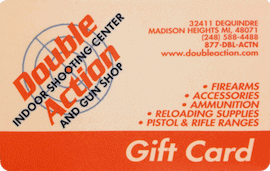 Double Action has been in business for over 25 years and has provided thousands of expert gun appraisals. We charge a small fee for each gun appraised. If your gun collection is large, we may be able to come to you. Contact Al today to setup an appointment.